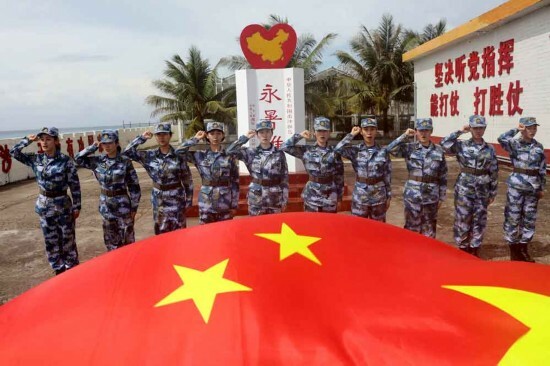 The People’s Liberation Army has sent 10 of its female members to join the garrison guarding the Nansha Islands in the South China Sea, according to the PLA Navy. The Navy said in a news release Monday afternoon that this has been the first time for female service members to be stationed on Nansha Islands, the country’s southernmost territories. They formally started working on Yongshu Reef from Monday. The 10 women are officers and sergeants with an average age of 23. All of them have a university diploma, the release said, adding they have been assigned to a wide range of posts such as staff, communications and medical service. 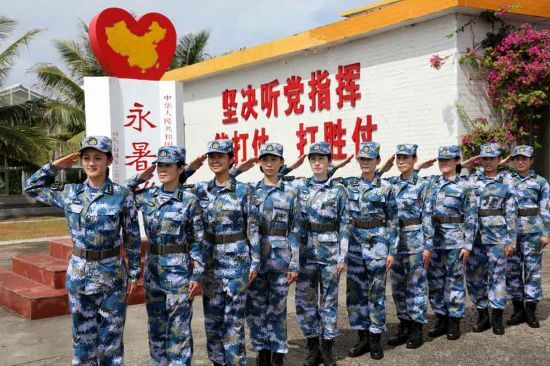 Zhang Jiahong, political commissar of the PLA Nansha Islands Garrison, was quoted by the release as saying that these female members will be sent back to the mainland every several months for rest to ensure their health. Zhou Yaling, one of the women, said Nansha is more beautiful than what they had imagined. “There are airports, harbors, streets, hospitals and sporting grounds. All of them make the islands like a lovely city on the sea,” she was quoted as saying in the release. Before them, there have been female PLA members on the islands but they were in short missions and still took orders from units that sent them there, the China Daily reporter learned.